The A-One Royal Cruise Hotel is unlike anything you have experienced! Designed to resemble a cruise ship, this resort offers four-star luxury and a fabulous location! The resort’s staff are dedicated to providing all guests with a fantastic stay every time, so they will go out of their way to make you feel great! Luxury was the inspiration for this hotel’s design, and the rooms show it! Well-appointed and with a private terrace, each cabin and suite is going to exceed expectation! Your favourite hotel room facilities and services are included, and yes, the fridge is well stocked! Choose to stay in a deluxe room or choose a suite! 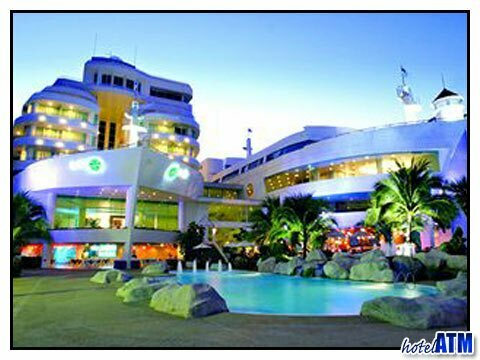 There are so many restaurants and bars to choose from at the A-One Royal Cruise Hotel! There’s the La Bateau Restaurant with local and international cuisine, the Maritime Restaurant for a la carte western and Thai dishes, the Seafood BBQ Buffet Dinner for international and Thai favourites, Inter BBQ Buffet Dinner for buffet dining al fresco style. For snacks and drinks there’s the Piano Lounge, Blue Wave Poolside Bar and Ocean View Coffee Shop and Internet Café. The resort’s many facilities include the Avarin Cruise Spa, Fitness One fitness centre, swimming pool, Jacuzzi, children’s pool, The Boat Music Place and Compass Karaoke!